The Edge-Lit Restaurant Sign is Shipped Directly from This Warehouse. Thousands of Displays are featured on this Website. This Edge-Lit Restaurant Sign is Popular with Shop Owners. Media Size: 34" x 11"
Edge-lit restaurant sign holds menus between 2 acrylic panels connected by stand-offs for an upscale presentation. Duratrans prints are recommended for use in the edge-lit restaurant sign, which are available at most local printers. 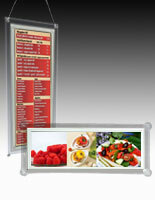 This edge-lit restaurant frame mounts vertically or horizontally for various types of signage. LED Light is energy efficient and lasts longer than ordinary bulbs. The edge-lit restaurant sign, like a lighted frame, draws a great deal of attention to signage in a room with poor lighting. Pictures for the display can be created from a regular computer printer. 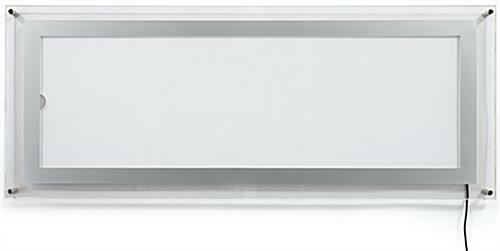 The LED edge-lit restaurant sign that is designed for lighting menus will accommodate two 11x17 sheets of paper. 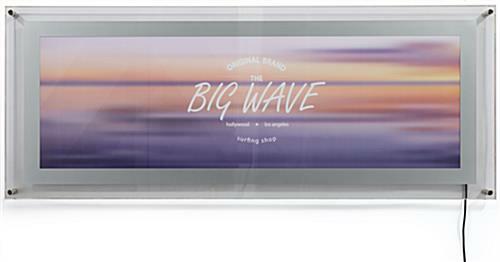 Showcase large graphics in this giant display. The edge-lit restaurant that is made of plastic has metal stand-offs and has a short depth. 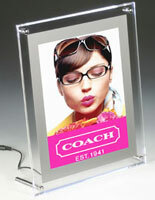 Unlike most lighted frames, this piece allows stores to highlight posters without sticking out far from a wall. This extra big edge-lit restaurant sign that plugs into a wall socket runs off less electricity than illuminated displays requiring traditional bulbs. 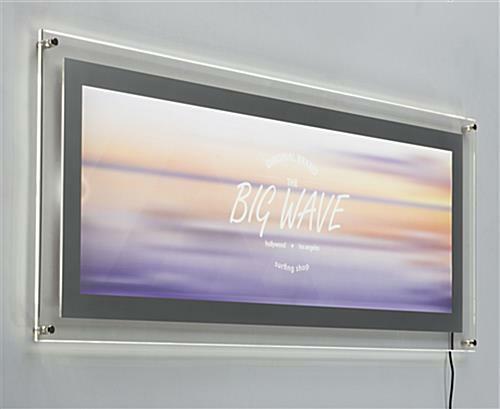 The light emitting diode panel inside the frame provides an intense light while remaining cool. 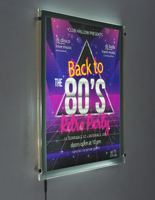 The large edge-lit restaurant sign is superb to hang near an exits or any other high prominence areas. 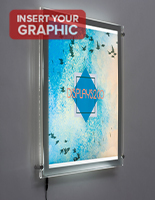 This product displays posters in between a couple of acrylic panels that are secured together with metal standoffs. 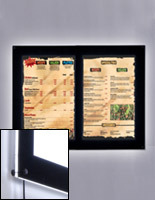 This electric edge-lit restaurant sign can hold a menu, making it great signage in a restaurant near an entranceway. 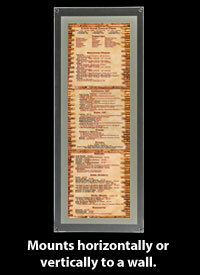 Posters can be changed out of the illuminated frame by unscrewing the four standoffs. This light up display, edge-lit restaurant sign is made of acrylic, making it weigh less than shadow boxes made of metal. 39.3" x 15.6" x 1.3"